MICHELLE: Well, I guess I’ll be predictable and go for the big debut this week—Witch Hat Atelier looks very charming. I desperately hope that, unlike a certain other seinen series with a young female protagonist with magical powers, there are no adult creepers in sight! SEAN: I agree, but I think the rest of MB will as well, so I’ll go for O Maidens in Your Savage Season, though I may be jumping the gun as only Kodansha’s own site lists it as coming out this week. It has a great pedigree, though, and I can’t resist a title like that. ASH: There are plenty releases this week that I’m looking forward to, including the two that have been mentioned so far, but my pick actually goes to Kitaro’s Yokai Battles. It’s been so long since the last volume was released, and I’m always delighted by the series. 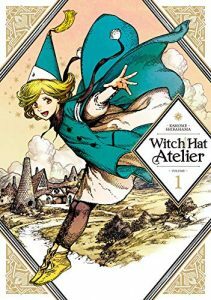 KATE: My comic shop got Witch Hat Atelier last week and it’s every bit as good as I hoped it would be. I’m getting a strong Miyazaki vibe from it — no squicky seinen overtones, no sappiness. If anything, it reminded me of Howl’s Moving Castle, as it has the rhythms and dramatic conflicts of a great children’s fantasy novel. MICHELLE: That’s a very encouraging comparison! ANNA: I think I’m going to throw in for Witch Hat Atelier as well, it sounds very appealing! MELINDA: I feel like a sheep, but honestly I’m all about Witch Hat Atelier, especially since Kate has confirmed an absence of smarm which, like Michelle, was the only question giving me pause. So that’s my pick, too!